This sunny warm 5-bedroom 2 bathroom house is situated on a large fully fenced 900m2 section, with fantastic views of Springfield Gold course. Perfect for sharing relaxing and fun getaway vacations with friends or family. Everything you need is supplied in the house, including all linen and towels (hotel quality and professionally laundered), plenty of new pillows, quality 4 burner gas BBQ, Netflix, body and hand wash, bath, detergent and full kitchen appliances. The home is newly renovated, fully insulated, double glazed, open plan with a heat pump in the lounge which warms/cools the house throughout. No cold Rotorua nights here! Additional cleaning fee for more than 10 people please enquire. Pets allowed with prior approval and are not allowed on the furniture or in the bedrooms. All dog poo MUST be put in the bin and not left on the grass. Please vacuum the property if pet has been inside. Extras: Cleaning. Required, NZ$90.00 per stay for up to 10 people, bookings of 10 or more, an additional cleaning charge will apply depending on numbers. 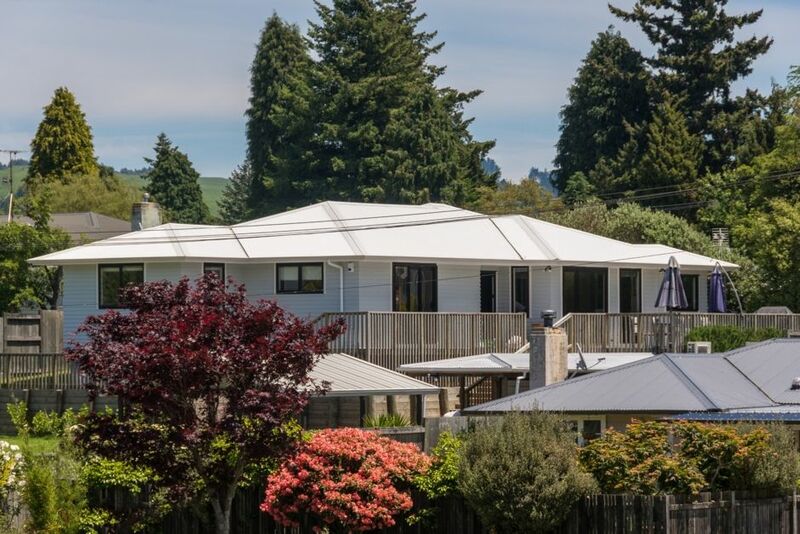 Close to Whakarewarewa forest, 2 of Rotorua’s best golf courses, International stadium, cricket oval, hockey pavilion, and a short drive to the lakes. It is less than 5 mins by car from city shopping and restaurants and other Rotorua attractions. No sulphur smells here. There is a local dairy, good chinese, Indian and fish and chips and other quality takeaways. New World is less that 1 km away. The famous Whakarewarewa Redwood forest is less than a 5 minute drive away. Here you can enjoy some amazing short and long walks or go horseback riding or take your mountain bike for a spin on the famous trails. Private with plenty of outdoor entertaining while watching the kids play, walking distance to Springfield golf course, 10 minutes bike ride to the forest trails 10 mins. Enjoy a hot soak at the Polynesian spa or one of the local free hot pools, pamper yourself with a spa treatment at the Waiora Spa or QE2 Spa facility, catch that legendary trout you’ve been dreaming of, go on a kayaking tour to discover our stunning lakes or go on a thrill-seeking white-water rafting trip. We met in London while on our OE. With a similar passion for travel, fishing and the outdoors we settled in Rotorua. This is the best outdoor playground in NZ! We have lovingly developed and fully renovated this property from an old 1950's state home completing a major addition into a very tidy, warm and modern holiday house for you to enjoy. This property considers all your needs while on holiday. Thank you to Rotovegas Homes for allowing us to stay in your beautiful warm peaceful and entertaining home. It was a great weekend had with family and friends!! We enjoyed a great weekend in Rotorua and the Springfield suited us perfectly. It was very clean and warm with great open entertaining space perfect for a big group. Open plan kitchen and living with a great outdoor deck area which is a nice little sun trap. Thanks for a great stay, would definitely recommend. Great place, stayed there 2x now and both times very enjoyable!! Accommodation was excellent, clean, tidy modern and good value, would stay again! Glad you enjoyed your stay at our home! Great, quiet location. Close to supermarket and other shops, and central for the attractions. Our 4yr loved it, and we felt it was very safe for him. We would recommend and stay again. We had 9 adults and this home was perfect for our stay. The beds were the most comfortable of all of the accommodations we used during our 17 day trip to Australia and New Zealand. After roughing it at a few locations it was nice to have such a clean home with WIFI and cable!